In celebration of Star Wars’ fortieth anniversary, and in anticipation of the release of Star Wars: The Last Jedi, I wrote an article here at Lewton Bus about how and why Star Wars has endured in such a singular way. The thrust of that piece, which I encourage you to go back and check out in full, was that Star Wars endures because it created a genuine modern mythology. It didn’t just ape story beats or character archetypes, Star Wars was the real thing. Like the myths of old, Star Wars held a mirror up to the society that created it, defining and reinforcing its beliefs and values in a way that made it indispensable to that society. Star Wars gave people disoriented by the radical changes of the 1960s and 1970s a sense of continuity with their past, a coherent and reassuring explanation of their present, and a reason to welcome, rather than fear, their future. Audiences found they could look to Star Wars for cosmological or metaphysical guidance, the way their ancestors looked to The Odyssey or even The Book of Genesis. Eleven years after Time Magazine asked “Is God Dead?”, and eight years after man walked on the moon, Star Wars gave an increasingly secular, space-faring people reason not to spite spirituality or fear the boundless un-knowability of the cosmos. For those anxious about the destruction of old social orders and morals in a post-sexual revolution, post-Watergate society, Star Wars provided the kind of sociological and pedagogical function that King Arthur and other epic heroes once did–Star Wars affirmed social disgust with tyranny, greed, and cruelty, and showcased the timelessness of heroic virtues such as selflessness, courage, and even forgiveness. Moreover, its easy fusion of cultural elements from around the world, from Japan to South America, also showed that there was reason to embrace the ascendant global monoculture. For entire generations of people, Star Wars was literally life-affirming. I was involved in a lot of study and work in folklore at the time… and through anthropology had gotten into folklore and mythology and the role it plays in a culture in developing certain anchors for certain societies and whatnot. And I came to realize that we had no modern fairy tales, and that you could say the western was the last of the myths. And I realized that it wasn’t good. I mean, it wasn’t a good situation not to have, for young people, some kind of a fantasy life that was very simply “there is good; there is evil, try to be good.” … All folklore is, I would say, anyway, is a form of religion. It’s the religious concept: there’s a god; there is a good; there is an evil; try to be good. I’m telling an old myth in a new way. Each society takes that myth and retells it in a different way, which relates to the particular environment they live in. The motif is the same. It’s just that it gets localized. As it turns out, I’m localizing it for the planet. I guess I’m localizing it for the end of the millennium more than I am for any particular place. In my previous essay, I argued that Lucas’ choice to create his myth for the whole planet, and to create it with a futuristic vocabulary, gave Star Wars a power that no other mythology has had–the power to change with the times. Unlike Gilgamesh or Beowulf, the relevance of Star Wars is not intertwined with the fortunes of any one society on earth or, contrary to Lucas’ humble explanation, any one era. As we change and evolve, the Star Wars galaxy has the unique ability do the same. We’re already seeing those changes, as Star Wars can move women and people of color to the forefront and make them heroes. It can turn its ire on the privileged. It can even kill its heroes. And it can make a billion dollars doing it. But this invites an obvious question: is there anything Star Wars cannot do as it changes with the times? This brings us to Star Wars: The Last Jedi. Again, nobody should have been surprised that Johnson would use The Last Jedi to interrogate Star Wars conventions and find out whether, if he took them away, it would still fly. But people were surprised anyway. Or perhaps people were just surprised at the degree to which Johnson stress-tested Star Wars, because his interrogation of the saga is so all-encompassing. The Last Jedi asks us to reconsider everything about Star Wars, and ask ourselves honestly what parts of it really matter. In other words, The Last Jedi wants to know what parts are essential–our rock and compass–and what parts are disposable? If what you want from Star Wars is strict adherence to a rigid cosmology and metaphysical framework, The Last Jedi is here to raze your temple. 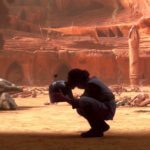 The Jedi religion is a failure–don’t trust it. The Force is not a superpower–you don’t own it. What the Force is, and what it can do, is not constrained by what you’ll find in old books. If what you want from Star Wars is a story about setting the world right through strength of arms, The Last Jedi is here to tell you to get your head out of your cockpit; that there are somethings you cannot solve by jumping in an X-Wing and blowing them up. There’s more to conflict than fighting, and more to fight against than just evil. There’s greed, and shortsightedness, and apathy too. If what you want from Star Wars is a stable of unimpeachable, virtuous heroes, The Last Jedi is here to tear down your monuments. The legends are a lie. Your heroes will disappoint you. No one person, no matter how strong-willed, can save us. If what you want from Star Wars is an image of humanity as conceived by a bunch of white dudes between 1977 and 1983, The Last Jedi is here to demand that you see the here and now, the world in front of your nose. Anybody can be a leader and a hero, regardless of race, age, gender identity, or personal style. Women don’t owe men explanations. And might doesn’t make right. It’s time to let such old things die. If that’s what you want from Star Wars and nothing more, then yes. Rian Johnson sure as hell threw it across the room and broke it. Of course, if what you want from Star Wars isn’t confined to a sacred text, if you are open to freer definition of what Star Wars is, then The Last Jedi isn’t throwing away any of the things that makes Star Wars, Star Wars. In true Rian Johnson fashion, The Last Jedi is just giving you Star Wars in a way you didn’t expect to get it. Because what The Last Jedi believes about Star Wars that the disenchanted don’t, is that its power is not in its characters or events or any other concrete element contained within it. It’s not in the particulars of the Jedi religion or the minutiae of how their spaceships work. That stuff can be interesting, surely, but they’re not the rock and compass that Lucas wanted us to cling to. He didn’t intend for us to derive lessons on good and evil from disquisitions on hyperspace ballistics. The Last Jedi understands that like all mythologies, the real power of Star Wars is in the telling. Our rock and our compass are not the story, but the storytelling. This is why, time and again, The Last Jedi gives you typical Star Wars set-ups with atypical payoffs–to focus our attention on the gulf between what the stories tell us and what our lives are actually like. Through a series of reality checks, Johnson asks: “Why should we care about stories that so transparently sell us a ridiculous fantasy?” So the aspiring Jedi goes in search of a master, and finds only a broken old man instead. So the hotshot pilot blows up the enemy, but it cripples his cause. So the lovable rogue comes up with a clever plan, but it fails. So the light tries to redeem the dark, but the dark isn’t interested. If Star Wars is peddling nonsense, The Last Jedi asks, then what’s the point of it? How does George Lucas’ mythology actually hold us all together if it’s just a lie? This is, incidentally, the perfect question to ask right now. Once again, our society is overwhelmed by cynicism and despair. Whether or not you’re young or old, liberal or conservative, religious or secularist, there’s a pervasive feeling that our leaders are not to be trusted, and that any distinction between right and wrong, or truth and lie, has ceased to matter. Just as we were in 1977, we’re all of us adrift in a sea of sinister uncertainty, desperate for reassurance that all is not lost. But how do we find that reassurance in a world with no heroes, and where victory must come by the ballot and not the bullet? How do we find the will to care when the temptation to “live free, don’t join” is so strong? Yes, he’s in the movie for a reason. The Last Jedi‘s answer isn’t the one fans expected, and not what many hoped for, but it is nonetheless the correct one if you think of Star Wars as a genuine mythology, the way George Lucas does. In its spectacular finale, Luke Skywalker finally stands fast against the entire First Order and saves the day. But the heroic Luke we recognize from our childhood returns only as a projection. Through a very simple metaphor, Johnson is reinforcing once again that, yes, Star Wars is kind of phony–that heroes like Luke Skywalker do not exist and will not swoop in and save us at the last minute; that, in this turbulent world, we’re on our own–but Johnson nevertheless believes that all the fakery of Star Wars has real value. Luke saves the day because just the idea of him has value of its own. Luke Skywalker’s brand of pure goodness and heroism does not need to be real in order for it to matter. Star Wars does not need to be real for it to matter. Any doubt about Johnson’s intentions are removed by The Last Jedi‘s epilogue, where young slave children huddle around crude toys and recreate Luke’s victory on Crait. Only something curious has happened in translation–this time Luke Skywalker, Jedi Master, is real. Through storytelling, the idealized Luke Skywalker, the legend, the lie, has been made true! And what’s more, these kids are inspired by the lie to make their lives better. The Last Jedi ends with one of those slave children gazing up at the stars and raising his broom like a lightsaber, imagining that he too can be brave and heroic like the Luke Skywalker of legend. It’s something that millions of real-life children have done since Star Wars appeared in 1977–probably Rian Johnson, included, and this author included. It certainly does not matter to him that Luke Skywalker is a mirage. And so it should not matter to us. Because, in mythology, it does not matter if the stories hold literal truth, if they adhere to a rigid continuity, or even if any of they make a damn lick of sense. Anyone who has read Le Morte D’Artur or The Bible knows that they lack historical credibility, and that their tales are often messy, confused, and riddled with contradictions. The Book of Genesis contains two versions of the creation myth! It contradicts itself in the very first chapters! But mythologies are not such fragile things that they can be broken by small heresies. Rather, mythologies endure because whenever we tell them, however we tell them, the stories carry a certain transcendent truth that inspires us. King Arthur and his brand of chivalry were never real in any literal sense. His legends contradict themselves and descend into all manner of absurdity. But the telling and retelling of Arthurian legends in all their variety has nevertheless had a clear and lasting impact. To this day, British society still idealizes what King Arthur and Camelot represent, and British monarchs are still naming their children after Arthur as a symbol to the public of their commitment to virtuous rule. The young prince Louis Arthur George, born just weeks ago, is but the latest in a very long line. There is good. There is evil. Try to be good. And may the Force be with you. Always.